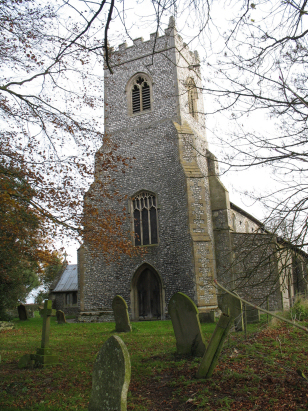 The parish of Baconsthorpe lies in northeastern Norfolk about 3 miles southeast of the small market town of Holt. Baconsthorpe sits in lanes about 2 miles south of the A148 road which links Holt with Cromer. The village is quite a dispersed one being spread over almost a mile from west to east between village pub and church. Baconsthorpe's main claim to fame lies in its 15th century castle which lies a half mile to the north, in reality this castle was little more than a moated house with a castellated curtain wall as fortification. At the time of this transcript Baconsthorpe would have been an arable farming community and the landscape around it is little changed with large cereal fields predominant. St Mary's church sits at the southeastern end of the village, on the southern side of Church Lane. 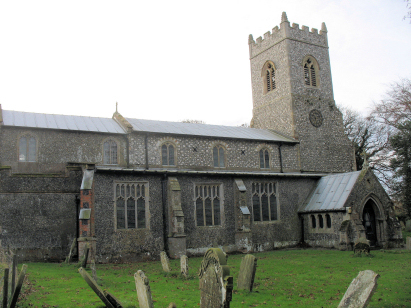 Outwardly this is another typical Norfolk Perpendicular church, Pevsner, however, is quick to notice the piscina which he dates to the period between 1260 and 1280 and is indicative of an earlier incarnation. That the church was extensively modified in the 15th century is undoubtedly true but this church has met with change throughout its history. The original tower fell in 1738 prompting an almost complete rebuild of both tower and areas of the church damaged by its fall. Further work followed in 1768, 1788 & somewhat more significantly in 1868. This wasn't the end of the changes as the roof was replaced in 1910. In all a much altered building outwardly similar to many other Norfolk churches. St Mary sits just east of the lane running to Plumstead and sits behind a low, brick topped, flint wall. With trees hemming it in to its south this is not the easiest church to adequately photograph. A single standard 800-entry register book covers not only the period of this transcript but tuns onwards for completion in 1914. This register is filmed on Microfiche 4 & 5 in the collection of Norfolk Record Office, images of this register are also available to view on Familysearch and these superior images were used to prepare this transcript. The piece was straightforward to prepare.